A chipmunk freezes in place for an instant to check its surroundings for danger near Westborough's Senior Center on Rogers Road. Now that acorns are underfoot on Westborough's trails and backyards, chipmunks are busy storing them up before disappearing underground for the winter. Eastern chipmunks (Tamias striatus) seem to be everywhere during the nice days of early fall. They scurry along stone walls, dart into underbrush, and zip across local roads with their tails held straight up. The chip-chip-chip sound that gives chipmunks their name accompanies us on fall walks in the woods. These chipmunks will soon be gone from sight, snug in their well-stocked underground burrows. When the first frosts arrive, they tend to vanish from the landscape. As they work ceaselessly to stock up, chipmunks stuff nuts and seeds into their special cheek pouches and carry the food off to their burrows. Their cheek pouches expand wonderfully, so a chipmunk can carry six large acorns at one time, or about 60 sunflower seeds (from guess where - somebody's bird feeder) in each cheek. Earlier in the season, they fill their cheeks with maple seeds. Chipmunks gather food obsessively as they prepare to hibernate, but they don't fatten up - as we think of bears as doing - for their winter sleep. Instead, they remain lean and awaken from time to time throughout the winter to eat from their stockpiles. They also depend on their hoards when they come out of hibernation in March for the spring mating season, well before the still-dormant landscape has much food to offer. You're not likely to see a chipmunk dart into its burrow, which is its safe haven. These quick little animals won't enter if they're being watched. They safeguard the location of their burrows in various ways. Burrows aren't safe if predators follow them there. When chipmunks make an entrance hole to their burrows, they dig up from below, carrying away the dirt in those useful cheek pouches. They fill some other underground tunnel with it, so they don't leave any dirt outside the hole to call attention to it. Chipmunks also block their entrance tunnels in the winter and sometimes at night. A chipmunk needs to watch out for owls, hawks, snakes, coyotes, foxes, weasels, and our very own pet cats. During its constant activity, it freezes frequently to check its surroundings for danger. 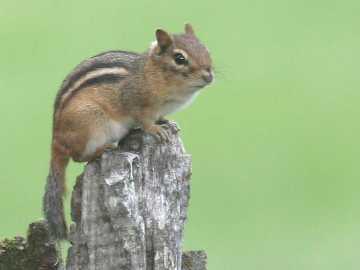 To escape, a chipmunk may disappear into a hole that doesn't lead to its burrow. Or it may climb a tree. Chipmunks do climb trees and shrubs, but they can't jump from branch to branch the way squirrels do. In the summer, you may spot a chipmunk up in bush, eating berries. Chipmunks also steal birds' eggs and eat insects and small animals such as mice and frogs. What are chipmunk burrows like? There's more to a burrow than you might suspect from its single 2-inch entrance hole, just wide enough for the chipmunk's body. The entrance tunnel goes straight down for a few inches and then slants off to a system of chambers 2 to 3 feet underground. The chambers are usually about the size of a football. The burrow can be 12 to 30 feet long. It typically includes a nest chamber, several food storage chambers, and escape tunnels. With such elaborate burrows, you'd think chipmunks might go in for group living. No way. They're loners, and quite feisty about it. The only time that a chipmunk shares its a burrow is when a mother raises her young. After that time, the young are no longer welcome. Digging its own burrow is one of the first things that a newly independent young chipmunk does. There it will live – alone – for the rest of its life. It chases away all other chipmunks that come within about 50 feet of the burrow. Chipmunks hibernate alone as well. When cold weather comes, they curl up in their leaf-lined nest chambers and allow their body temperature to fall as low as 43 degrees F. Their heart may slow to 4 beats a minute. In this state of torpor, their body processes are very slow and they expend little energy. They do rouse themselves from time to time to eat, and they may occasionally venture out of the burrow in the winter. Surprisingly, chipmunks don't always hibernate. In a year when food supplies have been unusually abundant, chipmunks may stay active throughout the winter, in spite of cold weather and deep snows. Why? In these years they've stored plenty to eat – enough to stay active and warm throughout the cold weather. Hibernation may be more a matter of surviving the lean times of winter than escaping the cold. Whenever you find yourself asking "Why are we seeing so many chipmunks this year? ", think back to those acorns underfoot. If the most recent acorn crop was a large one, as happens unpredictably from time to time, it may be your answer. A fall bumper crop of acorns nourishes the new chipmunks from the summer breeding season. Then it sustains the local chipmunk population throughout the winter, allowing them to reach the next spring.